Ai Weiwei often uses his art to critique political and economic injustice. 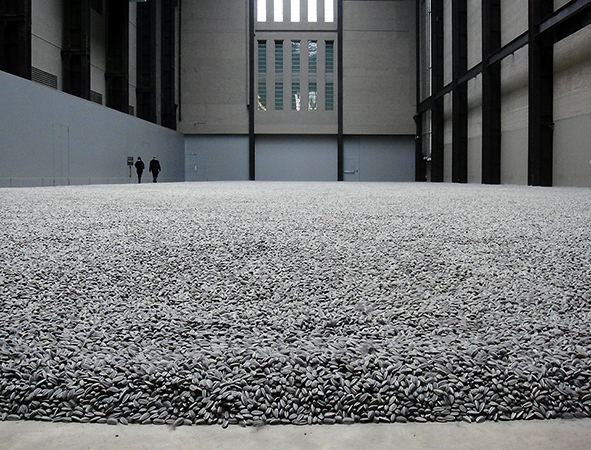 This can be seen in work such as his 2010 installation, Kui Hua Zi (Sunflower Seeds) at Tate Modern, London. Kui Hua Zi (Sunflower Seeds) consists of more than 100 million tiny, handmade porcelain sunflower seeds, originally weighing in at 150 tons. They filled the enormous Turbine Hall at Tate Modern, an industrial building-turned-contemporary art space. 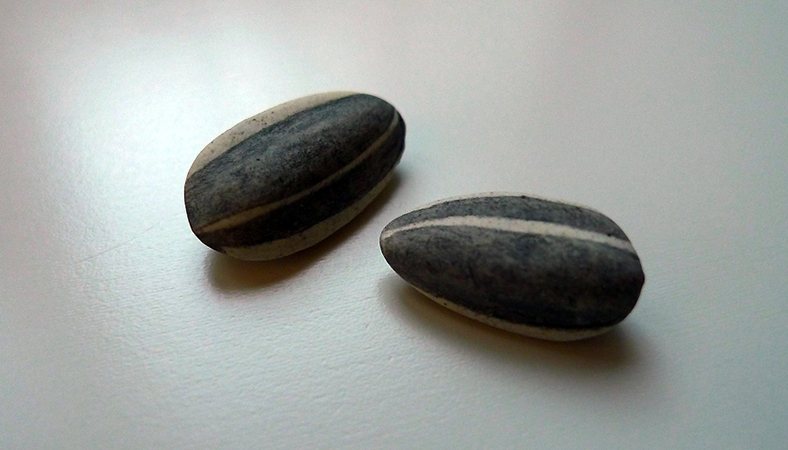 Sunflower seeds evokes a warm personal memory for the artist, who recalls that while he was growing up, even the poorest in China would share sunflower seeds as a treat among friends. The use of sunflower seeds as the basis of his installation was also designed to subvert popular imagery rooted in the artist’s childhood. Communist propaganda optimistically depicted leader Mao Zedong as the sun and the citizens of the People’s Republic of China as sunflowers, turning toward their chairman. 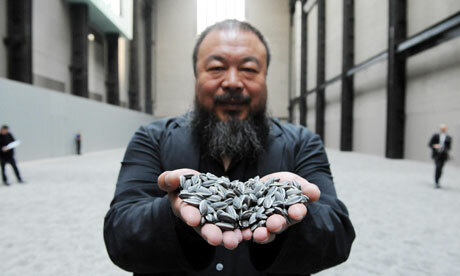 Ai Weiwei reasserts the sunflower seed as a symbol of camaraderie during difficult times. Though each of the 100 million carefully crafted individual seeds can draw the viewer’s attention, once arranged together in a neat rectangle, or covering the floor of an entire room, the hyper-realistic seeds create a sense of vastness. In the Tate installation, there was a sense of precision in the arrangement of the seeds, creating visual order and uniformity. The individual seed is lost among the millions, a critique of the conformity and censorship inherent in modern China. 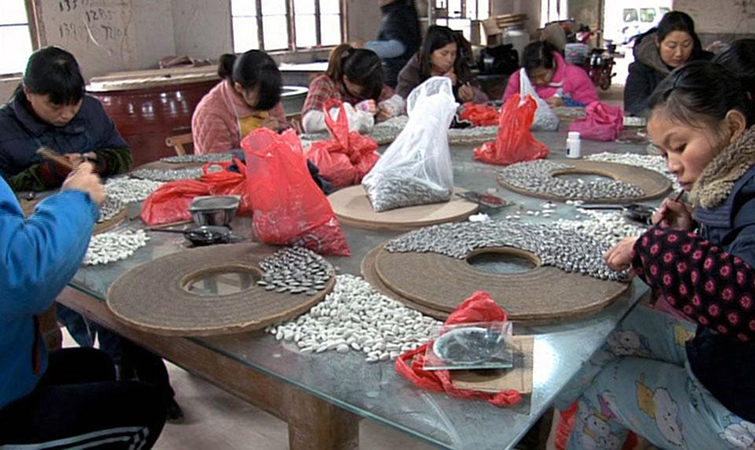 More than 1,600 artisans worked to make the individual porcelain seeds by hand in Jingdzhen, the city known as the “Porcelain Capital,” where artists have been producing pottery for nearly 2000 years. Porcelain, first produced during the Han dynasty in about 200 B.C.E. and later mastered during the Tang dynasty, is made by heating white clay (kaolin) to a temperature over 1200 degrees Celsius. The fusion of the particles within the clay during firing allowed artists to create vessels with thin but strong walls. Porcelain— a symbol of imperial culture in China—was also made for export via the Silk Road and became important to the creation of the idea of China in the West. Ai Weiwei’s use of porcelain comments on the long history of this prized material while also rejecting the common negative connotations of the modern term “Made in China.” Utilizing skilled artisans known for their exquisite craftsmanship to make objects that can only be differentiated one from another upon close inspection, alludes to the important porcelain tradition in Jingdzhen, as well as to the uniformity and diffusion of modern (cheap and fast) labor that is responsible for China’s hard-won place in the world economy. Sunflower Seeds asks us to examine how our consumption of foreign-made goods affects the lives of others across the globe. How we experience an artwork impacts our perception of the work. In the tradition of participatory contemporary art, Sunflower Seeds asks the public to physically interact with the art. 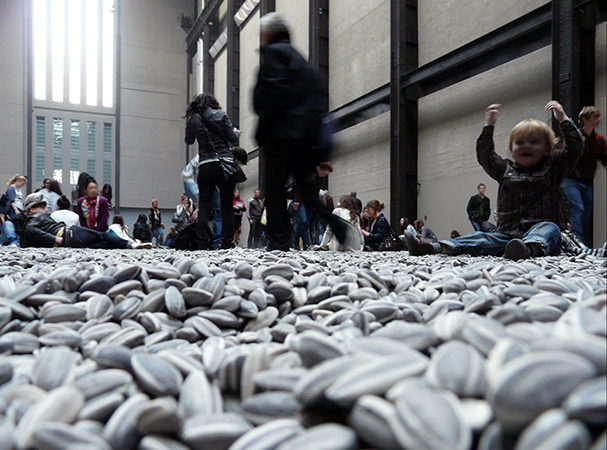 Initially, Tate visitors were invited to walk over and lie on the seeds, though the museum, in consultation with the artist, suspended this opportunity about a week into the exhibition because of safety concerns. Ai Weiwei was arrested at the Beijing Capital International Airport on April 3, 2011 during his Tate exhibition. He was detained for 81 days. The artist, along with many in the international community, asserted that his true offense was his political activism for democracy and human rights. Ai Weiwei had blogged for four years—investigating cover-ups and corruption in the government’s handling of a devastating 2008 earthquake in Sichuan and the country’s hosting of the Olympics. Ai Weiwei’s blog was shut down in 2009. Since then, he has turned to Twitter and Instagram. During his detention, the international community, including major US art institutions, rallied for his release. Officials eventually released him, charging Ai Weiwei with tax evasion, but his passport was withheld, preventing him from leaving the country for four years. It was returned in 2015. Ai Weiwei’s continues to address issues of human rights in his work. 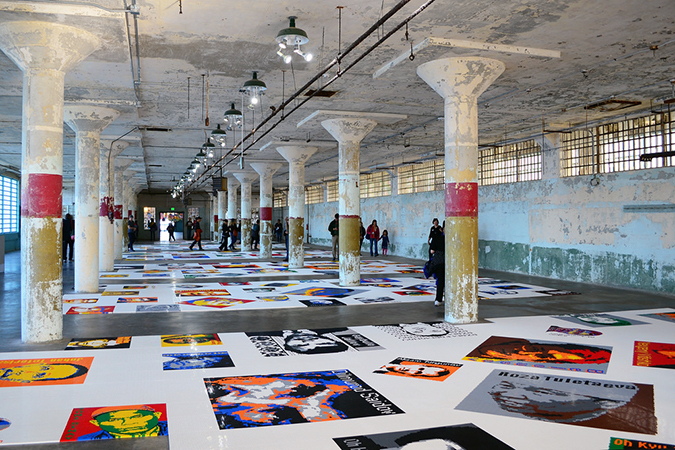 The 2015 exhibit @Large, installed on Alcatraz, the former island prison in the San Francisco Bay, comments on surveillance, freedom, and political prisoners by mixing fine and traditional arts with pop culture materials including silk dragon kites and Lego portraits (above). Cite this page as: Megan Lorraine Debin, "Ai Weiwei, Kui Hua Zi (Sunflower Seeds)," in Smarthistory, August 9, 2015, accessed April 23, 2019, https://smarthistory.org/ai-weiwei-kui-hua-zi-sunflower-seeds/.